Taxidermists hate the word stuffed. And since The Fifth Annual Carnivorous Nights Taxidermy Contest was stuffed with taxidermists, it was important to get the vocabulary down right from the start. “It took me six months to mount the squirrel,” shared Melissa Milgrom, one of the judges and the author of Still Life: Adventures in Taxidermy. Yes, the accepted term is “mount,” a verb that provided endless chuckling in the crowd in response to the stories of some deadpan and earnest presenters. 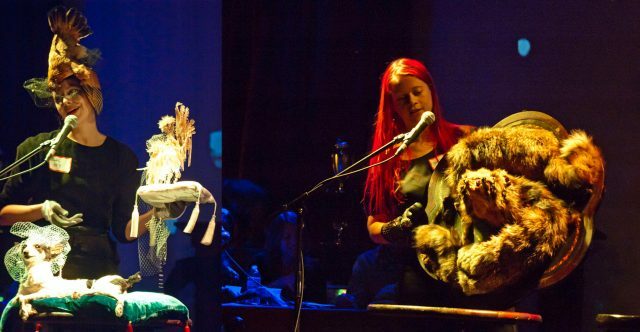 More than 300 macabre art enthusiasts, nature aficionados and seekers of the exotic packed a Brooklyn social hall December 7 for the contest, which was hosted by The Secret Science Club, a group that organizes lectures, art events, and performances covering the underground world of science. A conventional science lecture it wasn’t. Deer heads hung on either side of the stage. A woman with a bird hat posed for a photo, and a man with a gigantic rabbit under his arm and about thirty strands of Mardi Gras beads around his neck mingled with the crowd. “Werewolves of London,” “Nothing But the Dog in Me,” and “Monkey Gone to Heaven” played in the background while attendees sipped on the drink of the night: “Wet Specimen.” The event, which sold out, officially commenced with a salute to the Rump Ape, an ape head with an American Legion-style hat on and declared representative of the future of the human species. Taxidermy is a rather general term that includes several diverse methods of re-creating a three-dimensional animal that looks life-like (although some taxidermists have gone rogue and no longer strive for anatomical correctness). The word itself came from the Greek taxis, meaning movement, and derma, meaning skin. The combination refers to the traditional method of removing the animal’s skin and then molding it over a constructed body, though many modern taxidermists reproduce the entire animal from scratch. Like building a model rocket, they order separate parts online such as glass eyes, pre-made teeth, and a fake saliva called “Jaw Juice” and skip the once-living animal ingredient altogether. Taxidermists are Renaissance men. They need a variety of skills including molding, tanning, and casting, along with artistic flair and a true reverence for the natural world. Mummification doesn’t count as taxidermy because it involves drying a body out rather than removing and then stuffing the skin. Some of the twenty-four entries were professionally taxidermied by the owners, others were purchased in foreign countries or ordered off Ebay, and others were found on the side of the highway and taxidermied in the kitchen. Some “animals” never existed in real life, like the infamous Wolpertinger. The “Most Twisted” award went to Emmy Mikelson for her mount called “Tunnel Vision”-a five-headed zombie rabbit that she claimed to have killed in Iowa “a while back” with a “boot stamp… one for each head.” Despite confronting a zombie, she said she didn’t need any Holy Water or silver, only rubber. The llama, “Dolly”? I was sure this was a reference to the Dalai Lama!